How Much Does it Cost to Have a Baby in the Hospital? This past year was an exciting year for my husband and me. We had our first child, a boy, on December 20, 2013. It was a great Christmas present and a nice way to end the year of 2013. Now that it is January, the hospital bills have started to come in and let’s just say that I am astonished about how much the hospital bill ended up being. I am a nurse and know that the services I provided as a stress lab nurse are expensive so I expected our hospital bill to be expensive. My husband and I had a bet on who would guess the closest amount to how much it would be. He said that it would probably be around $10,000 and I said $25,000. One of us was right (well one of was close to the figure); keep reading to see who was. 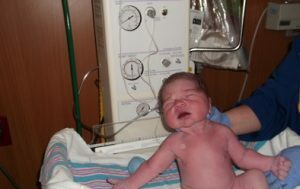 In addition, I want to talk about my experience with the labor and delivery nurses that helped deliver my son. I know many of you are interested in becoming a labor and delivery nurse so I want to tell you what it was like to be a patient (since I am usually the nurse) and how my encounter was with the nurses. So, when you think about the cost of having a baby you may say to yourself “I know this will be expensive.” Moreover, yes you would be correct in saying this. I recommend that before you decide to have a baby, you have health insurance. I have health insurance from my job and I am very thankful for it. I am going to break down the costs of everything from the prenatal visits, physician charges, labor & delivery hospital charges, post-partum visits. Note I am not including in this calculation my son’s doctor’s visits: which included his circumcision (performed at doctor’s office), hearing test, and pediatrician visits because I have not received the bills for that yet. How much it Cost to Have a Baby? I had an amazing experience with the nurses I encountered during the birth of my son. It was my first time having a baby and I was very anxious. Being a nurse, I know about the many things that can go wrong. The saying is true sometimes “Ignorance is bliss.” However, the nurses I had were calm and very knowledgeable about what they were doing which made me feel better. What do labor and delivery nurse do? I was in labor for about a total of 20.5 hours. During the labor process you mainly encounter the nurse and you will probably only see the doctor about 2-4 times before you actually give birth. I seen the doctor when I was admitted, two times while I was progressing, and then for the actually delivery. What did the nurses do for me? Above is what I encountered with the nurses during my labor and delivery. I had a great nurse during the actual pushing part of my son’s birth. She was a great coach and very positive. If it was not for my husband and nurse, I don’t know how I would have got through it. Labor and delivery nurses are so essential for the birth your child. I don’t know if they know how important they actually are to their patient. After everything was said and done, I was very happy with my birth experience but very shocked about how much it all cost. Healthcare is crazy expensive! I hope this article helped open your eyes to the actual costs of having a baby, and what a labor & delivery nurse does during the birthing process.